I go for warmth and comfort when I dress during the winter. It’s definitely a matter of function over fashion. Come spring and summer, I have no doubt people will ask how much weight I lost because I look so much heavier with the TONS of baggy clothes I wear to stay warm. Thanks to my friend and fellow dog-lover Dave, Sport was able to stay warm during our double digit sub-zero temperatures last week ~ the lowest we saw on the thermometer was -12. 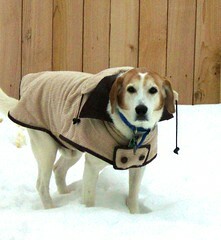 And he looked darned handsome while he stayed warm, don’t you think? If sport could talk he must be saying “I can’t run, mama, this is too heavy.” Love the picture of him. Oh my goodness–I love that coat! I think I need to get one for Lucy–too cute!